The Newburyport Preservation Trust's Historic House Plaque Program continues to generate enthusiasm among historic homeowners. The program provides owners of the many hundreds of historic homes in Newburyport with the opportunity to proudly identify their house with a plaque that indicates the original owner/builder, their occupation (if known), and date. Central to the program, and of particular historical value, is the verification of dates, names, and facts by experienced researchers. Dedicated stewards of Newburyport's older homes can begin to learn the factual background of their home, and showcase their stewardship with a plaque validated by the Newburyport Preservation Trust. If you are an owner/steward of a historic house in Newburyport and are interested in a historic house plaque for your home, read the application form here. 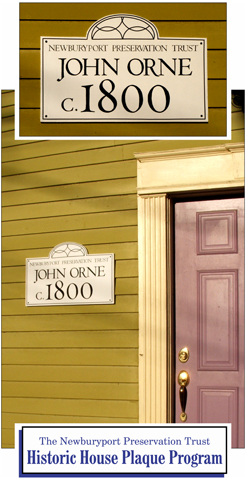 The application form, in downloadable and printable PDF format, consists of program information; a documentation checklist; criteria, fees, and process; and a one-page application to be filled out and submitted by postal mail (Newburyport Preservation Trust, Historic House Plaque Program, P. O. Box 184, Newburyport, MA 01950). The flat fee for the research is $500. (Alternatively, the homeowner may submit their own research, which will be verified at a cost of $50 per hour.) The cost for the plaque is $450. A deposit of $150 is required. At the conclusion of the process, along with the historic house plaque, the homeowner receives a "chain-of-title" packet, copies of all deeds associated with the address, and a research summary. Since the program's inception in 2014, research has been completed and plaques mounted on a growing number of historic homes. Research continues on current applications received from eager participants. NPT's Historic House Plaque Program seeks to encourage appreciation of Newburyport's broad range of domestic architecture, educate residents and visitors about the architectural styles throughout our neighborhoods, endorse thorough research and documentation of evidence, and introduce consistency in Newburyport's historic house signs. Locals and visitors alike who venture off the beaten path of the downtown, and stroll Newburyport's residential neighborhoods, will notice homes here-and-there that already have a historic house marker. Some are very well-worn, and for some, the research that beget them in the first place is long-gone. The Newburyport Preservation Trust Historic House Plaque Program, with rigorous research and verification at its core, raises the bar for such markers, and in doing so fosters appreciation for the authenticity of our historic neighborhoods. If you have one of Newburyport's cherished older homes, read more about NPT's Historic House Plaque Program here, and encourage appreciation of Newburyport's domestic architecture by applying for a plaque for your home.